When you hear the word “putty,” does that bouncy, shapable toy you were always told not to get stuck on the floor come to mind? Hopefully, by the time you are finished reading you’ll have a different perspective of this word. 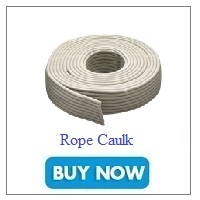 Rope caulk is a putty substance that is less of a mess and more of an advantage around the house. When installed in the right places and at the most opportune time, caulk can relieve the stress on your home’s energy consumption and your energy bills. You can easily (and cleanly) solve these problems by sealing air leaks with rope caulk. Summer brings warm weather and longer days, but it’s also the season for bugs to come out and play. If (like me) you prefer for critters to play outside of your home, you should close up all potential areas of entry with caulk. For those of you living in a rental property and/or don’t want to make any long-term changes to your house,Â rope caulkÂ is a non-permanent solution to insulating your home. Even better, the installation is easy, the removal is clean, and the caulk is durable. It comes in a gray or brown color. Installation: How and when to use it. First, clean the area where you’ll use the rope caulk to prevent any dirt or grime from making the caulk less sticky and therefor less able to seal properly. Cut the amount of rope you need. Firmly press it into the crack/gap you want sealed. This isn’t written in stone, but it’s easier to install caulk during warm weather. The caulk is softer when warm and will stick into cracks and gaps much easier than it would when cold. Mortite rope caulk adds a whole new meaning to “like putty in my hands,” and offers a whole new meaning to home insulation with its easy-to-install, energy efficient, and money saving qualities. If installing the rope caulking in warmer weather is not possible and the caulk refuses to stick to the surface after proper cleaning then try warming the surface with a heat gun on a low setting. Keep the gun moving and don’t get it too close to the surface; you don’t want to soften paint or melt or warp plastics. You only want to warm the surface enough to get the material to stick. I had some caulking come loose from a window; I just warmed it a little with a heat gun and was able to stick it back just fine. I also found that warming the caulking on a metal or stone surface in front of a fireplace makes it more pliable and easier to to shape. Hi Patricia! Apply rubbing alcohol to the caulk. That should make it easier to scrape away. I have large gaps around my windows. I was hoping to fill the gaps with caulking cord, then caulk over top of that with paintable caulk before painting my window trim. Will this work? Has anyone tried this before? I know the caulking cord doesn’t dry up, so I was unsure about doing this. Thanks!